Will Eliot’s poem resolve itself in a neat and tidy conclusion? Find out next Tuesday in the exciting grand finale of “The Love Song of J. Alfred Prufrock”! This entry was posted in "The Love Song of J. Alfred Prufrock" by T.S. 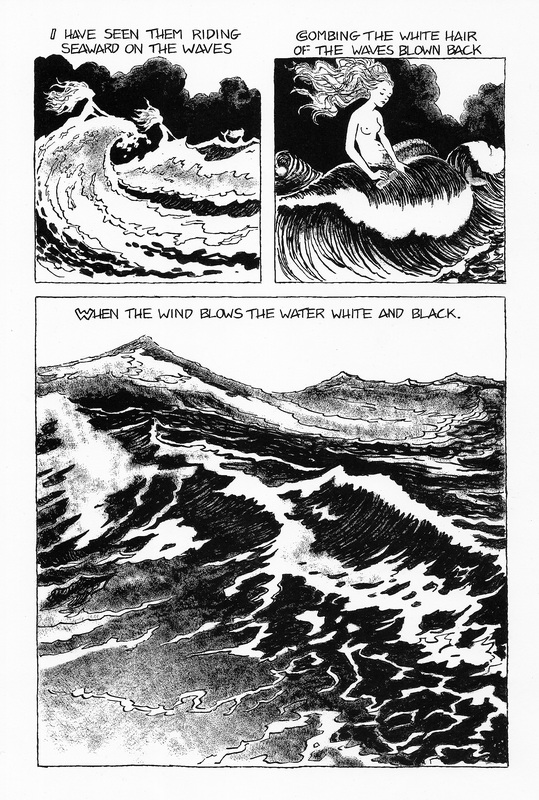 Eliot, comics, illustration, Poetry, Poetry Comics and tagged combing the white hair, mermaids, sea, T. S. Eliot, the love song of j. alfred prufrock, waves, when the wind blows the water white and black. Bookmark the permalink. Thank you Jennifer! Spreading te word is key and would be much appreciated! I’ve heard from so many teachers that tell me they are using my comics as a teaching tool, and I’m hoping this is an effective angle by which to propose this project to potential publishers. I like this so much. I’ve always loved the poem and once memorized it. Your creative adaption brought me greater understanding. You did a brilliant job. I love what you did. You made me realize how extremely visual and dense with imagery the poem is ….. and how poignant. I found this on Zite …. so glad I discovered your work. I read this poem in my twenties, translated it into my own language in my fifties, and It is such a joy to see it in images when I am now in my sixties. Thanks, Mr. Peters. Thanks! What language did you translate the poem into? Certainly a mammoth undertaking! Chinese. I translated it to say good bye to it. It’ s not so mammoth as putting the words into flesh and blood though~~ That’s why your images revived the fun for me. Thanks!